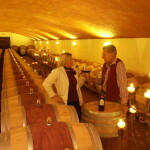 Chianti wine estate with modern cellar, Agriturismo, olive grove, vineyard and land. 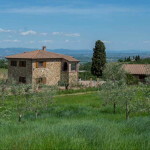 Excellent opportunity to purchase a modern working vineyard and agriturismo. The vineyards of “Tenuta Chianti Classico”, are located on a hill, 400 metres above the sea level, in the noblest part of this unique and extraordinary land. The landscape is the typical of the Chianti area, where the vineyard is embraced by oaks, chestnut, holm oaks, spruces and low forest and the bumps and falls are favorably sun-exposed. The estate covers an area of about 101 hectares (249,58 acres) including 11,3 ha of vineyard, 3 ha of olive grove with 400 olive trees and 83,8 ha of woodland. 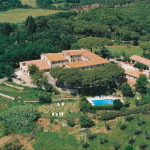 In this particular context is located a beautiful Agriturismo, among the well-groomed rows. The Cantina is a masterpiece of architecture and modern wine development. Nothing was spared to build it. The entire construction, started in 1998 and inaugurated in 2000, is not only an architectural jewel which reflects and enhances the beauty of the estate, but also technological, with computerized systems for heating and cooling system, controlling all the wine-making process, the use of stainless steel, the modern systems of squeezing out and filtration, the continuous renewal of the oak barrique fleet. It is in this environment that is matured an exceptional Tuscan wine, obtained with Sangiovese, Cabernet Sauvignon and Merlot grapes, an award winning wine. The cellar is set on three levels, linked between them with a modern lift. Cellar master, winemaker and owner have a look around before deciding on the various systems in the “greatest wine estates” of Europe, to then decide, with the permission of the local owner of a replica in the Vinification equipment. The Barrel cellar is a unique place. Completely set underground, gives to wine a mystic climate if silence, with a constant natural temperature all year-round, excellent for wine refinement in French oak barrels. On the basement is set an ultra-modern Bottling- and Branding machine, air-conditioned magazines and a prestigious reception area, offices and laboratory complete the winery. Nestled in the vineyards, with outstanding scenery, four apartments are located directly on the new winery – they arose in a former farm. On the ground floor of the farmhouse there are three independent apartments with living room, kitchen, bedroom and bathroom. The fourth and biggest apartment is located on the first floor and it hosts a living room, a kitchen, two bedrooms and two bathrooms. All apartments have central heating according to excellent standards, satellite TV and well equipped kitchens. In the apartments there are open fires. All the apartments are equipped with private pool and large park. Currently the winery produces annually about 60.000 to 70.000 bottles: divided into: 5000 bottles of Chianti Classico, 10000 bottles of Rosso Igt (Cabernet Sauvignon 60%, Merlot 35%, Petit Verdot 5%) , 20000 bottles of Rosso Docg, 2000 bottles of Bianco Igt, 20000 bottles of Rosso Igt (Cabernet Sauvignon 50%, Merlot 30%, Sangiovese 20%) and 3000 bottles of Rosato Igt as well as some Grappa of Chianti Classico. The actual capacity is, however, without any further investment, at about 180.000 bottles per year. The land included in the sale boasts also 100 olive trees producing fine olive oil, with green reflexes and a light walnut taste, is obtained with high quality olives, picked up by hand, carefully selected and kept dry for a maximum of three days to the moment of squeezing out. The property is completely fenced and the privacy is warranted by an elegant entrance with automatic iron cast gate. There is the possibility of buying also a manor house, which dates back to 1500. The building, carefully restored, has a total surface of 450 square metres and is composed as follows. -Manor’s quarter: living room, kitchen, four bedrooms with en suite bathroom. -Three apartments with independent entrance. 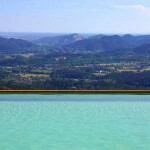 The property includes a terrace of 200 square metres which makes you enjoying the superb panorama of this place. The pool is set in a private position, surrounded by plants and flowers and is equipped with Jacuzzi. The pool house, includes a bar, summer kitchen and gym. The property is completed by a cellar of 100 square metres, an underground parking of 120 square metres for six cars and 24,07 hectares (59,48 acres), of which 1,2 ha of vineyard, 2 ha of olive grove and 18,26 ha of woodland. LOCATION Hilly, panoramic position .